Okay, now that you’ve decided to start your own DIY electric conversion project, your next step is to find a good donor car for your EV conversion. Have you decided what type of car model you want to retrofit into an EV? Most people will find this part quite challenging because there are literally thousands of different car models around. How would you choose? One way that you can make your selection is to base it on the price of the car. Why not set a target for yourself and begin your search by identifying donor car below $1000. If you are wondering how to find a car for sale under $1000, here are 3 tips that may help you. The first step is to figure out what type of car that you need. Do you want a front or rear wheel drive vehicle? For DIY electric car conversion, it is best to choose a car with rear wheel drive because it is much easier to connect the electric motor to the transmission unit. For a homemade electric car, it is best to choose a donor car with a manual transmission. 2) Do your research on the make and model. Do your own research and read as many articles and reviews on the car model as possible. Read reviews from current owners so it’ll give you an idea what to expect. You can also read car consumer reports to determine whether you have chosen a reliable vehicle. The consumer reports will usually give you the car performance, repairs history and also a list of problems with the car. 3) Dig out the history of the car itself. Check out what is the history of the car you are planning to buy. Has it been involved in any accidents? Are there any modification done to the car? Get all the information you need from the seller of the car and then determine whether it is right or not for your EV conversion project. If you are from the United States, you’re in luck because you can actually find cheap cars from government and police auction sales. Every month across the United States, thousands of vehicles are seized by different Government agencies (IRS, DEA, FBI) and the Police departments and auctioned off to the public at incredible deals. Due to certain laws, these vehicles are listed and sold at up to 95% off their original value. If you are lucky, you can get car deals way much better from any used car dealerships. You can save a lot of money if you know how to find these types of government auctions. 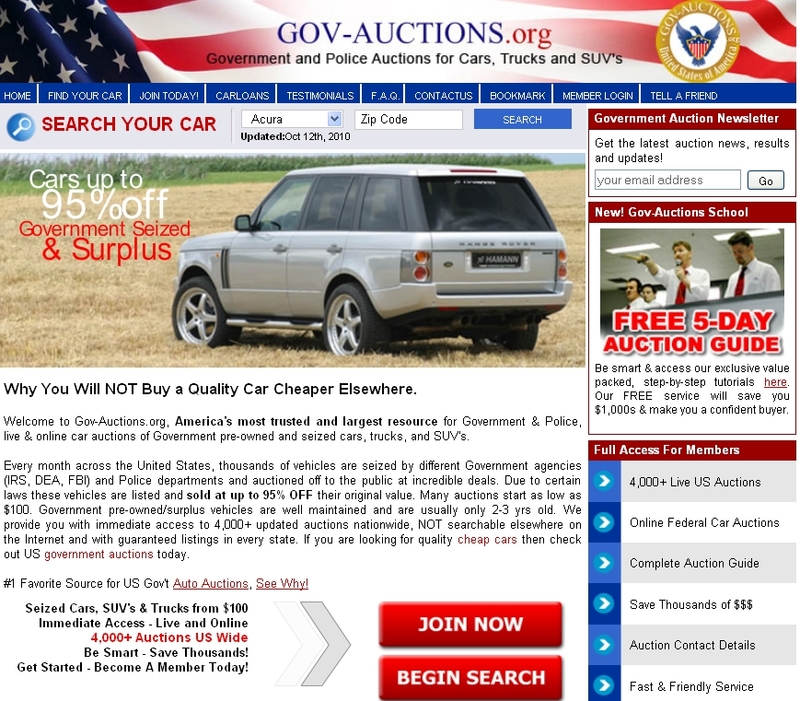 If you are planning to look for government auctions on cars, use the service provided by www.gov-auctions.org/. They have a search function that will list down all the cars available for auction based on the model and also location. Check out their service right now to find cheap cars! ==> Click here to visit Gov-Auctions.org now! i most especially agree with number 2. most people fail to do their research on the make and the model of said cars. hence, they barely know what they need to know concerning the make and model of said vehicle. Hence, not all are aware of proper maintenance of its car parts and how much it would cost them for replacements later on. Let us work on our 1st project, together. It shall be a Toyota Corolla 2008 model 1800 CC front wheel drive car. We should develop a complete kit so that it could be tested thoroughly and replicated on other similar vehicles. Range is not an issue right now, we remove the engine, and replace it with BLDC motor with a controller. Battery pack and charger we shall use from a local source. Batteries should fit in along with the motor and inverter in the engine compartment. Performance of the car (Acceleration and speed) should be better than with a gasoline engine. We should prefer to use 48 V system if it could meet the above requirement otherwise you can suggest higher voltage system. Kindly source for us motor and a controller. We shall develop adopter plates and mountings, locally. I hope the existing gearbox will be good enough. Awaits for your recommendations with pricing. How will we run air-conditioning and heaters? I was considering a PT Cruiser. It has the space for a descent battery pack and has a lighter weight class. My choice: a Volkswagen Vanagon. Positives: rear-engine, easy access to transmission, manual transmission, high gross weight rating and lots of room (so you can stuff it with batteries), very utilitarian and can carry a lot (we want to use it for vending at a local farmers’ market), manual steering, readily available motor brackets. Negatives: a bit of a classic, and priced accordingly, but I’m looking at one with a blown engine next week — for $500! 95% of our driving will be round trips to town of about 26 km, but up a sizeable hill, back down into town, then repeat to get home. So I’m thinking an AC system with regen braking would be worth the extra expense, no?